PROVIDENCE, RI -- Wiggle Kerbrat led the way for the New Hampshire Avalanche with a pair of goals, including the game-winner in the 3-2 victory. 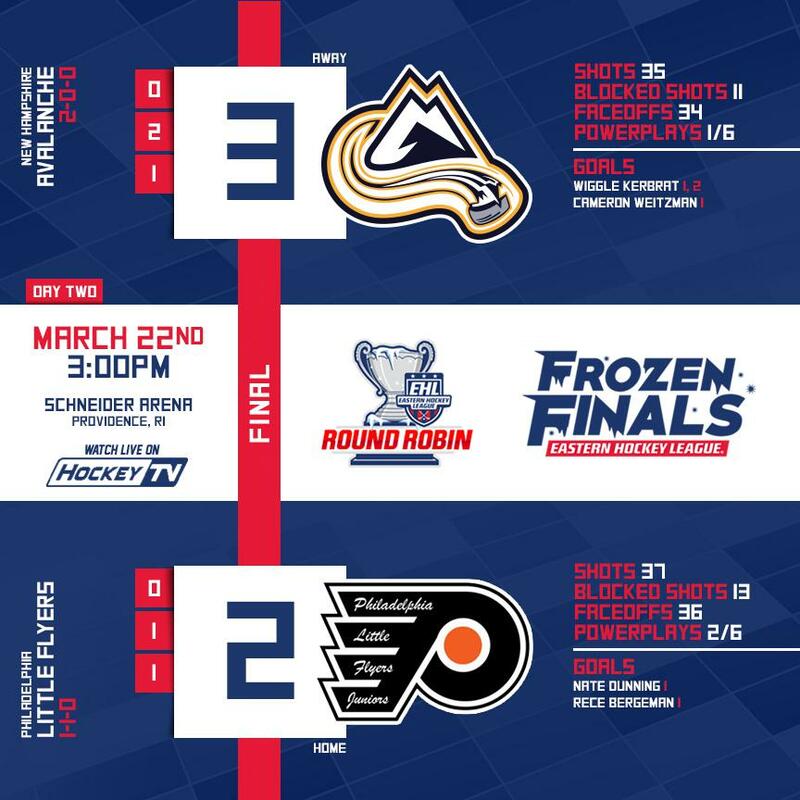 Below you'll find all of the goal recaps from the third game of the 2019 EHL Frozen Finals. Both goaltenders stood tall in net as the game remains scoreless through the first period of play. Nate Dunning got the Little Flyers on the board first with a shot from the point on the power play at the 14:15 mark of the period. Reece Bergeman collected the lone assist on the tally. Just 46 seconds later, Kerbrat collected a cross ice pass from Jake Adkins that sent him on a breakaway and slid the puck five hole to knot up the game at one goal a piece. With just 13 seconds left in the period, Cameron Weitzman converted a rebound chance from a Tim Cronin shot to give the Avalanche a 2-1 lead. AJ Przystawski had the second assist on the goal. At the 12:56 mark of the frame, Bergeman converted in front of the net on the power play with helpers from both Bryce Witman and Austin Master to tie the game up at 2-2. With just 3:22 remaining on the clock, Kerbrat tipped in a Niks Krollis shot from the point on the power play to give the Avalanche a late 3-2 lead.